Scientific Background: DNA replication in Saccharomyces cerevisiae initiates from specific DNA sequences called autonomous replication sequences (ARSs), many of which have proven to be chromosomal origins of replication. The six subunit origin recognition complex (ORC) was identified initially by its ARSs binding activity in an ATP-dependent manner. ORC functions as a recruiter of cofactors such as Mcms to origins, and may also play a role in transcriptional silencing. ORC2 is the second largest subunit of the ORC but its specific function in eukaryotic cells remains unclear. In yeast, ORC2 is involved in suppression of late origins. 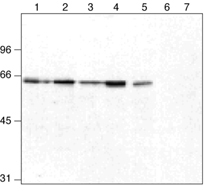 Western blot analysis: Jurkat (1), Raji (2), JepG2 (3), HeLa (4), U937 (5), NIH3T3 (6), WR19L (7) cell lysates, probed with ORC2 mAb (3B7).